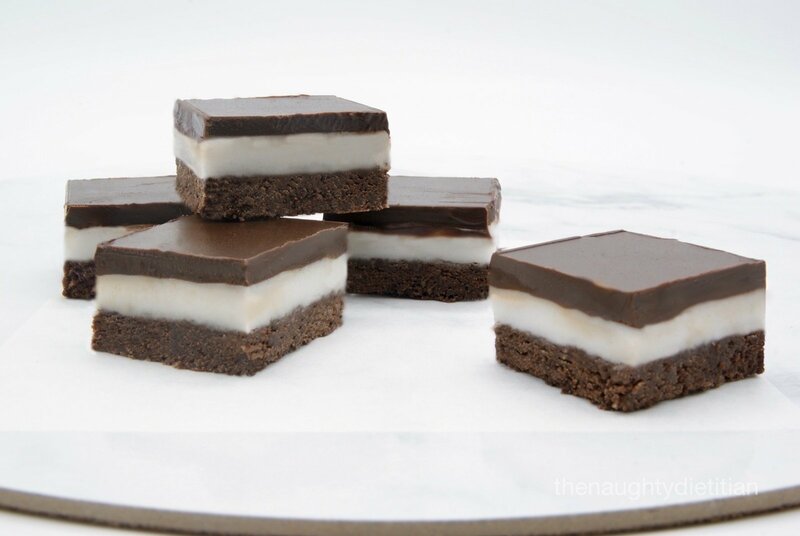 If you enjoy peppermint chocolate you will LOVE this Gluten Free Peppermint Slice! If you haven’t already, you need to add peppermint slice to your repertoire of baked goods. Though I’m probably a little biased as peppermint chocolate is my second favourite (behind caramel chocolate of course). This peppermint slice recipe is super easy to make with only 10 minutes of actual baking required. If you’re on morning tea tea duty at work, or for your next party, go ahead and make this recipe and let me know what you think? Oh and if caramel chocolate is your favourite you might also want to check out my Gluten Free Salted Caramel Slice. Preheat oven to 180°C and line a 16 x 26cm slice tin with baking paper. Place the flour, cocoa, sugar and butter in a medium size bowl and mix well to combine. Then press into the base of the slice tin ad bake for 10 minutes or until firm to touch. Set aside to cool completely. In a large bowl, place the icing sugar, water and peppermint essence and stir to combine. Working quickly, spread the filling over the slice base. Then refrigerate for 1 hour until firm. Tip: you can use the back of a metal spoon to help smooth over the filling before allowing it to set. Place the chocolate and oil/copha in a medium sized heatproof bowl over a saucepan of simmering water. Stir until the mixture has melted and is smooth. Then pour the chocolate over the peppermint filling and refrigerate for approximately 30 minutes or until firm. Cut the slice into the desired size squares using a hot knife. Then refrigerate until ready to eat! This entry was posted in Food, Slices and tagged Afternoon Tea, Chocolate, Dessert, Gluten Free, Peppermint, recipe, Slice. Bookmark the permalink. Subscribe me to email updates!